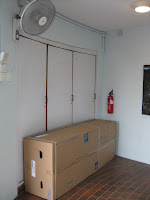 SCOB - Science Centre OBservatory: Air-Con Has Arrived!! I just received word that our new air-con unit for the main observatory is here. Hurray!!! After 20 years the observatory will finally have air-con, Friday night stargazing will never again be such a sweaty affair. Actually, it remains to be seen how effective the cooling effect will be, especially as it has to cope with the huge opening in the roof that enables us to see the sky. 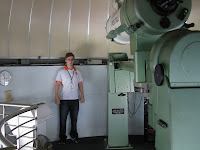 There should at least a cooling breeze around the telescope, providing a more comfortable environment for all......hopefully. Hearing the news, I was excited, naturally, so I ran down with my camera to record the prestigious moment of installation. There it sits just waiting to come out of its box. 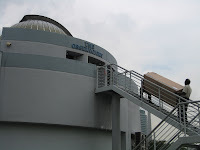 Although we will still have fans on around the perimeter of the observatory, it dawned on me that the fans on the upper level (around the telescope) will be seldom used once the air-con is up and running. 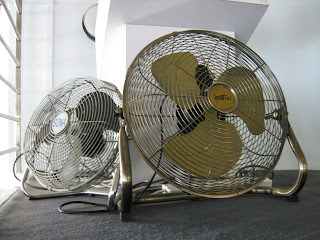 Dear fans, you have performed your duty with honour and will always have a special place in the observatory (probably a dusty corner in the storeroom). We bid you a fond farewell and thank you. After the farewell ceremony, I was surprised to hear that the air-con will only be installed tomorrow....bother!! Therefore, I took a picture of where the air-con will be located, with myself as a stand-in (literally) for the air-con unit.